Double Detailer is a clear, deep penetrating, water based, impregnating sealer. This car wash and wax advanced formula creates a molecular bond within the substrate pores yielding unequaled repellence characteristics, while permitting essential vapor transmission. The auto wash and wax produces an invisible barrier, preventing staining from acid rain, water, oil and dirt; because they stay on the vehicles clear coat, for easy cleaning. 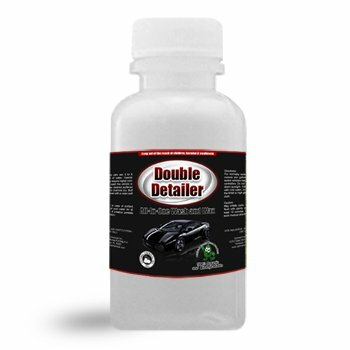 Double Detailer is safe to use on any clear coat and non clear coated surface. Cuts auto detailing labor by 50% and is a concentrated solution to bring more shine and protection with less application use Will not change the natural color of auto paint, clear coat or other masonry surfaces, and will not turn white paint yellow. Provides weather-resistant finish that is a slip and scuff resistant and allows for maximum vapor transmission. Keep in mind that your finest hotels, professional detailing companies, general contractors, novice auto detailers, use Double Detailer routinely, to seal and protect their customers vehicles and their own vehicles as well.